IMPORTANT: If you do not live in the USA, Canada, Puerto Rico or the UK PayPal and Google may not be able to confirm your shipping address. Since we only ship to confirmed shipping addresses, customers in other countries may have to use other payment methods. Such as MoneyGram, bank wire transfers, bank checks, etc. Express Mail International $49 3 to 5 business days Tracking number is available, but, it may not track package to final destination in all countries Customs label number is available RECOMMENDED as the most cost effective, fastest, most reliable shipping method. Of course, Global Express Guaranteed, Fed-Ex or UPS is better. But, it is much more expensive. While Priority Mail International mail does work most of the time, it is usually pray and wait. But, Priority Mail is faster than regular air mail. Since there is no tracking number, by selecting this shipping option, the buyer is accepting the risk for post office delivery. 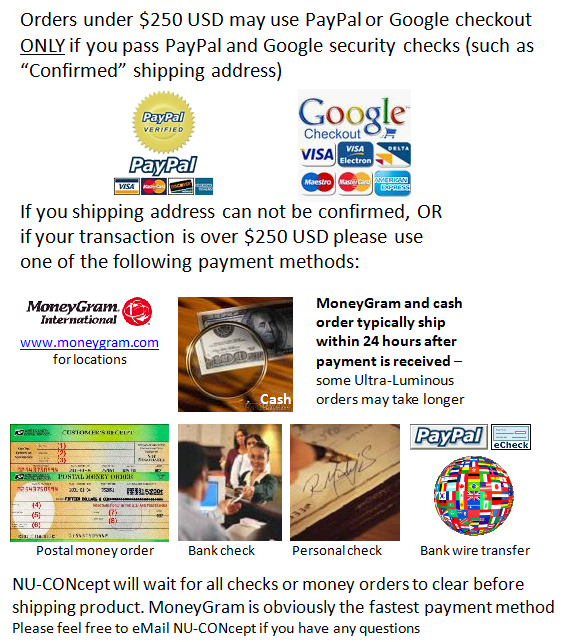 Note: If you used PayPal and a credit card, with a confirmed shipping address, and are in Canada, Puerto Rico or the United Kingdom you must send NU-CONcept an eMail waver stating that you "do not want a tracking number provided for your order. The buyer assumes risk for delivery". If you are not willing to send this eMail, please select the Express Mail ($38) or Global Express Mail options below, in order to obtain a tracking number which is required by PayPal credit card users. If the buyer uses a PayPal eCheck, Western Union, MoneyGram or other payment method. NU-CONcept can ship using the $12 Air Mail option without question. While regular air mail does work most of the time, it is usually pray and wait. Since there is no tracking number, by selecting this shipping option, the buyer is accepting the risk for post office delivery. Global Express Guaranteed OR Federal Express (Fed-Ex) OR UPS (United Parcel Service) $75 - $130 1 to 3 days Tracking number is available from the courier to final destination Customs label number is available Ask for a price quote, but, it is estimated to be about $75 - $130 or more depending upon package weight and destination country. NU-CONcept strives to ship all orders within 24 hours of payment. (baring holidays, weekends or vacation). Note: The customs form number can not be used for tracking. NU-CONcept estimated International shipping costs from the "US Post Office" web site "http://ircalc.usps.gov/" which is less expensive than federal Express (Fed-Ex) or UPS. If you want to check shipping costs, feel free to go to the http://ircalc.usps.gov/ web site, select your "country", select "package", select weight of approximately "1 pound 7 ounces". Then it "continue" for a price quote. Express Mail International ($49) - RECOMMENDED as the most cost effective, fastest, most reliable shipping method. 3 to 5 business days; INCLUDES tracking number, which IS available to USA border/flight. Tracking outside USA depends upon whether destination country scans in package. Note: PayPal should be able to confirm shipping addresses in the USA, Canada, U.K. Puerto Rico. Over time PayPal will expand countries which they can confirm addresses to. We must wait for personal checks to clear before shipping merchandise. Sometime Google will charge you for shipping and sales tax twice. If so, please continue checkout and eMail us. We will credit you the difference due to the accediental double charge that Google sometimes does. (*) NOTE: Global Express Mail / FedEx does not ship to all countries. If regular FedEx, UPS or DHL must be used for international shipment, NU-CONcept will notify you if additional shipping costs need to be paid once the package is weighted by the courier. NOTE: There are no shipping address restrictions if you make payment via a bank wire transfer, MoneyGram, bank check via mail, etc. Please eMail me or include a description of what you are ordering WITH your shipping address. I can ship to any address if you do not use PayPal or Google as a payment service.